Black Eggman with his wings spread. Black Eggman, referred to Metal Robotnik in the English dub, is the antagonist in the first half of the Sonic OVA. He's a giant egg shaped robot with interchangeable arm attachments. He also has missile launchers built into his chest area and expandable wings and a jet-pack on his back. His voice and personality perfectly match that of Robotnik. It is later found to be a mecha driven by Dr. Eggman and the "kidnapped" Princess Sara when it is completely destroyed by Sonic. He is voiced by Edwin Neal in the English dub and Junpei Janikuchi in the Japanese dub. Interchangeable Arm Attachments, including machine guns and pounding fists. Glue-like shots which fire from a compartment in his rear. 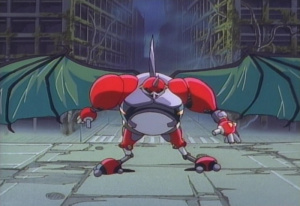 He is introduced as a rival of Eggman whom conquered his city (called Eggmanland in the original, but Robotropolis in the English dub) and sabotaged the city's Robot Generator, which generates power to the city. This is set to cause a giant explosion due to the excessive energy being produced. When Sonic and Tails approach the Ancient Ruins he attacks them as soon as he sees them. He forces them off a bridge and they try to fool him into thinking they are dead. He catches them as they try to leave and starts to pelt them with his Glue weapon and Tails becomes stuck to the fence. He fires some missiles at Sonic but he manages to grab and steer one of them back into him. Sonic gets stuck on the floor afterwards and it starts to cave in and fill with water. Just as Black Eggman is about to shoot Sonic, Knuckles knocks him to the ground and frees Tails. During the battle with Knuckles he runs out of ammo so he resorts to picking him up and squeezing him. After Sonic is pulled out of the hole by Tails he slices Black Eggman's arm off with a Spin Dash and then impales him twice as he tries to fly away. Sparks emit and then he explodes and falls into the water far out of their view. Eggman and Sara emerge from the vehicle unharmed. Black Eggman comes back one more time in nonfunctional form as Sonic and his friends reach Eggmanland. It appears he's perfectly alright until his minions drop him. He crumbles to the ground finally revealing to everyone that this was simply a mecha being piloted by Eggman and Sara. Black Eggman (Known as Brak Eggman here) is a placeholder for the final boss in Sonic Robo Blast 2. He was originally meant to go into Dark City Zone as the boss, but since that zone isn't made yet, he is in Egg Rock Core Zone (the final level), for now. This page was last edited on 28 November 2018, at 09:04.